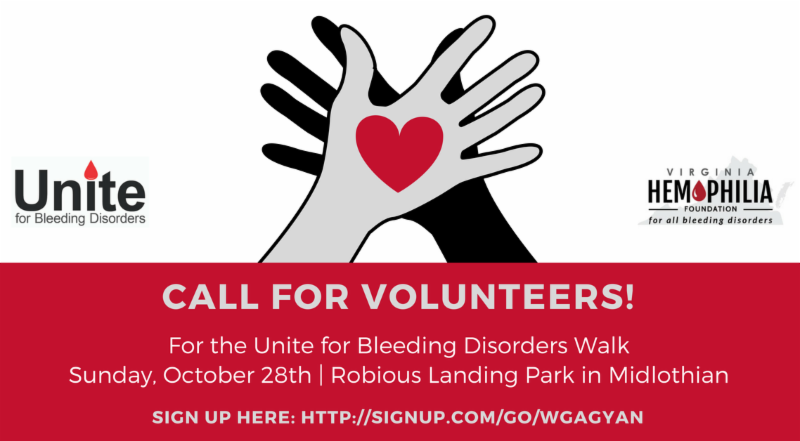 Unite for Bleeding Disorders - Join Us on Sunday October 28th! 1-mile walk, accessible for all fitness levels! All funds raised will stay right here with VHF to help send children to Camp Youngblood, create a pool of emergency patient assistance funds, offer guidance and support for newly diagnosed families, and empower us to advocate for health care for families living with a bleeding disorder. 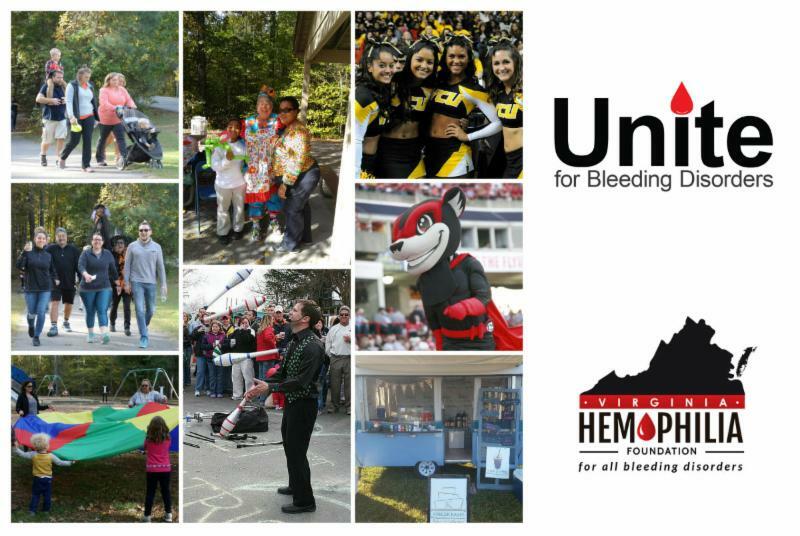 This event is free and open to everyone both inside and outside the bleeding disorders community. Walk t-shirts will only be available to those individuals who are registered and have raised a minimum of $25 by Thursday, October 11th. GO HERE TO REGISTER AND START FUNDRAISING TODAY! Are you looking to give back to the VHF community as an event volunteer? Are you part of a club or social organization that likes to give back? We are looking for some amazing event-day volunteers! You can be a fundraising participant for the walk, but it is not required. 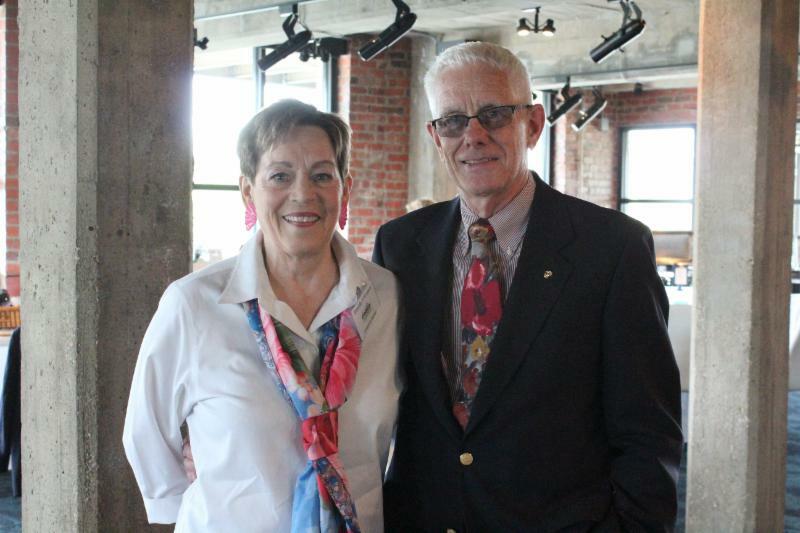 VHF is so grateful to our long-time donor and volunteer, Dorothy O’Connor! Dorothy has given back with her time and donations to VHF for nearly two decades—at different times serving on our Board of Directors and as a founding member of our spring fundraiser committee. She attributes her long-time service to a quote from Helen Keller that hangs in the VHF office: “Alone we can do so little; together, we can do so much." Dorothy says, "that is the reason I have been a part of this organization for almost 20 years: knowing that our future depends on us all working together and supporting the programs, events and fundraisers." Thank you for your support Dorothy, we are honored! Go here for more information on how you can give back to VHF. An enthusiastic group of families joined VHF at the Science Museum of Virginia for an afternoon of fun, learning and exploration on September 8th. Attendees enjoyed lunch while getting tips on fundraising and the new Unite Walk on October 28th, then had the rest of the afternoon to enjoy the Science Museum’s many exhibits! Thanks to our generous sponsors NovoNordisk and Shire. ﻿ Go here to see event photos. Affected women, caregivers and family members had a great night of connecting with new and old friends while focusing on self-care at the Hilton Hotel and Spa in Short Pump. The night started off with a mini-spa treatment and was topped off with a delicious dinner and an empowering presentation on meditation by Diane Dimon, Dr. RS. Save the date for our new women’s retreat weekend scheduled for February 9-10, 2019! Thank you to our program sponsor CSL Behring. Go here to see event photos. Thanks to all of you who advocated for expansion for the past five years, on January 1, 2019, approximately 400,000 uninsured Virginians will become eligible to enroll in Medicaid. VHF is a member of the Healthcare for All Virginians (HAV) Coalition , and we were one of over 100 organizations that worked on this expansion. In addition to this expansion, the state also proposed a 1115 Medicaid waiver or “work requirement”, called Virginia COMPASS . This waiver could possibly reduce coverage for thousands of Virginians if approved. 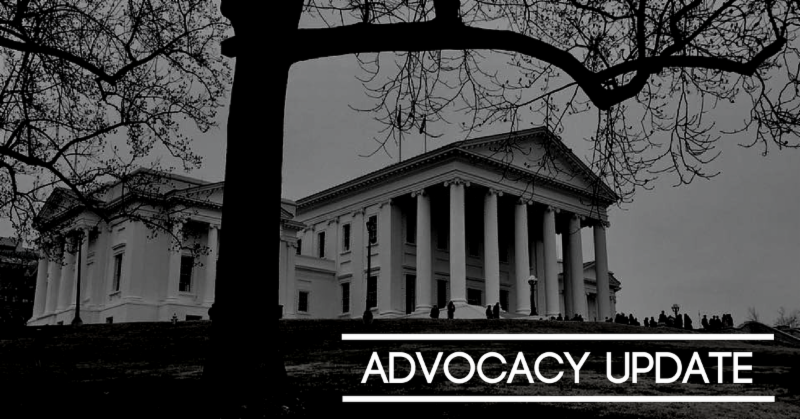 Next step in the advocacy process will be for us to express concerns to the Virginia Department of Medical Assistance Services (DMAS) and the Centers for Medicare & Medicaid Services (CMS) about this proposed waiver. Thanks to our colleagues at The Commonwealth Institute for drafting an auto-fill email to help with this process. All you need to do is go HERE and follow the easy steps to submit your individual comments by October 20th. Spoiler alert: this will be easy and like writing an email that is pre-filled for you and clicking on a button and the whole process will take no more than five minutes! 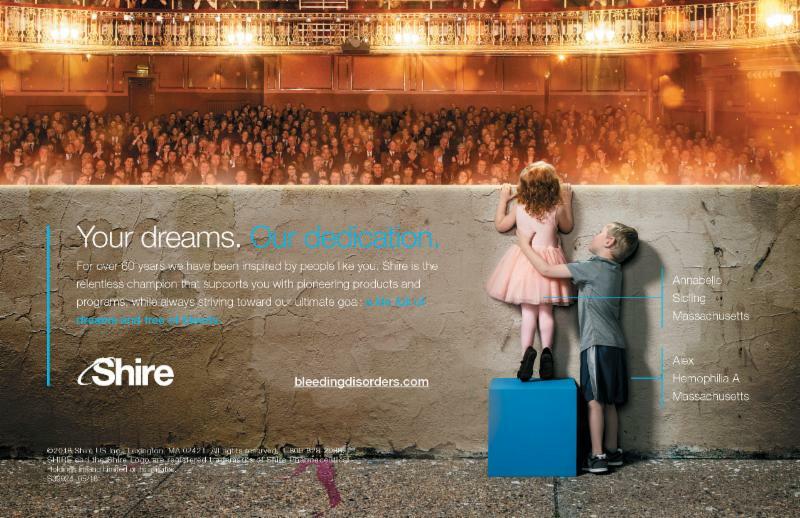 Hemophilia Federation of America (HFA) developed "Dear Addy" to answer questions from the bleeding disorders community related to advocacy issues. Go here to learn more. Dear Addy: With the midterm election fast approaching, does HFA have any tools to assist voters? 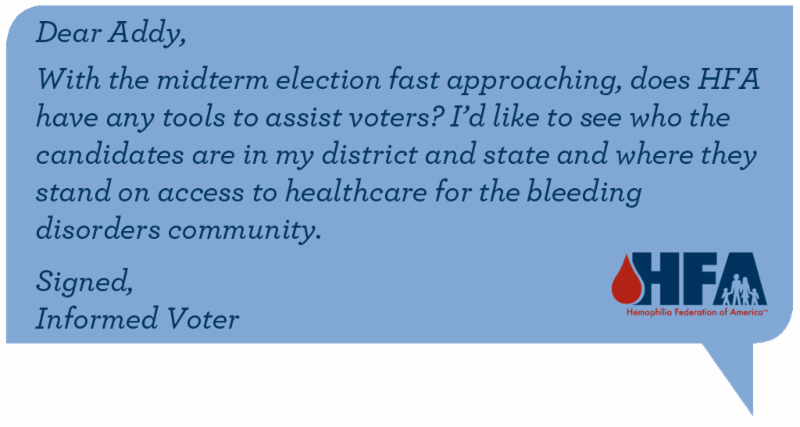 I’d like to see who the candidates are in my district and state and where they stand on access to healthcare for the bleeding disorders community. Dear Voter: This is a great and timely question with the midterm election less than two months away! Voting is an important way to make your voice heard and advocate for the bleeding disorders community. HFA’s newly updated Take Action Center has a great tool to help you register to vote or verify your registration status, find polling locations, and request an absentee ballot . If you aren’t registered to vote, make sure to do so as soon as possible as some states require that you register by a certain date before the election. NYLI offers young adults ages 18-22 in the bleeding disorders community the opportunity to learn valuable skills while giving back. Apply today!